Salsify produces multiple stems one to three feet tall that when torn emit a milky sap. The leaves are long and very narrow. Each branch produces one flower head. The daisy-like yellow flowers open early in the morning and often close by late afternoon. The longer the days the more likely it is to flower. Later the plant forms a seed head that resembles a dandelion but is distinctly larger. The seeds themselves are long but featherweight. These seeds break easily from the flower and can travel long distances in the wind. The seeds typically survive in the soil for less than a year. Salsify has broad tolerance to climatic conditions and grows in a wide variety of soil types. Some experts consider it an invasive weed but others suggest that salsify is not aggressive and that control is seldom necessary. Studies and observations suggest that salsify's survival, growth, and reproduction may be reduced by the presence of neighboring vegetation. In any control or management plan, salsify's importance to wildlife should be considered. Livestock and wildlife utilize salsify, sometimes extensively. Flower and/or seed heads are consumed by sage-grouse, dusky grouse, pronghorn, and white-tailed deer. 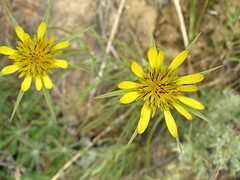 Salsify has been used to treat dog or coyote bites, boils, sore throats, and internal injuries of horses. Young salsify leaves, stems, and roots are edible. Local Native Americans chewed the coagulated milky sap like gum before swallowing it. The fluffy pappus (featherlike hairs) on the fruits was used to make “cotton” for stuffing pillows.